Are You Even A DU Kid If You Haven't Hung Out At These 10 Places? Being in Delhi University has its perks, one of them being the ability to gain insider info on all the great (and cheap) places to eat around town. It is during their time in DU that most people drop by places like the Gwyer Hall Canteen, or try the bhelpuri outside Hindu College. If you were a DU kid, or had friends who were in DU, chances are you’ve been to most of these 10 epic hangout spots. If not, what are you waiting for? If you’ve never heard of Tom Uncle’s Maggi Point, we’ll refrain from judging you and, instead, give you reasons to drop by (because you need to – ASAP). Located near Ramjas College, this Maggi point is a tiny food stand that has been around since 1978. A stall that started with just noodles is today a full-fledged business, offering more than 50 kinds of Maggi, a variety of soda, chaat and pasta options that all DU students and Delhites in general have grown to love. On a good weather day, a cold coffee and the company of some friends at Taj CCD is everything that will make you wish college would never end. Taj CCD, unlike most CCDs, is airy, spacious and surrounded by trees. It’s the ultimate favourite hangout spot of JMC, Maitreyi and Venky folks, and, well, for a reason. When wallets are empty and hunger levels are insane, Chache Di Hatti’s chhole bhature can make a world of difference. This Kamla Nagar eatery only does one thing – chhole bhature, and they do it so well that it’s usually over before 2pm. Chache Di Hatti is takeaway joint, so we recommend that you get food packed for home – but be prepared to wait in the line. More often than not, you’ll find this place jam-packed with students (not just IIFT folks, but DU kids too). A visit to this dhaba generally ends with the self-proclamation that you overate (’cause it’s sooo good), but at the same time, doesn’t burn a hole in your pocket. During our college days, we OD-ed on the massive keema paratha here, and would never regret the calories it came with for a second. D-School canteen’s mutton dosa has been a student favourite for the longest time. The mutton cutlet, masala coke and chowmein here are some other popular dishes. We also remember that the JP Tea Stall outside it used to be one of our favourite places to grab a cup of chai during those unbearably cold winter mornings. Satya is definitely one of the favourite hangout spots for South Campus kids. While new restaurants and cafes open and old ones shut every few months, we were lucky (and still are) to have places like BYD, Woodbox, QD’s and Kev’s as constants. Kev’s Mexican Maggi, BYD’s pasta and Woodbox’s shakes have continued to be some of the most comforting things for us. Any student who has studied in North Campus, will always love Patel Chest. It’s got everything that any student needs – from photocopy and internet cafes, to numerous tiny (but great) eateries – and everything in between. The bhelpuri stall near the Patel Chest Institute, the Patel Chest Chaiwalla (for bun-butter-chai) and Hot & Fresh (for Chinjabi food) are some of our favourites. Hudson Lane’s overflowing with affordable cafes and restaurants, most of which serve stellar food. However, there are a few restaurants that have stood the test of time, like Rico’s, BYD and Cafeteria & Co. When you’re not in the mood to experiment, and don’t want to think too much about where to eat in Hudson Lane, these eateries are the kind of fool-proof places you can always rely on. If you’re bored of the usual, drop by Cantino, Sambookas and Spezia Bistro maybe? Kamla Nagar’s Chowringhee is typically a favourite student hangout spot. Crisp, meaty rolls loaded with flavours and chutney are what saved our broke selves from dying of hunger during college days. It also helps that their service is good and quick. Plus, isn’t it great that there are so many Chowringhee outlets around town, all so perfect for those broke-but-hungry days? Diggin is loved by most Delhi folks, but you’ll usually find DU kids chilling here in between (or ahem, during) their lectures (lucky you, Gargi and KNC folks). It’s one of those places most students save up for, because well, this Italian cafe’s pasta, pizza and thick shakes are worth every penny. 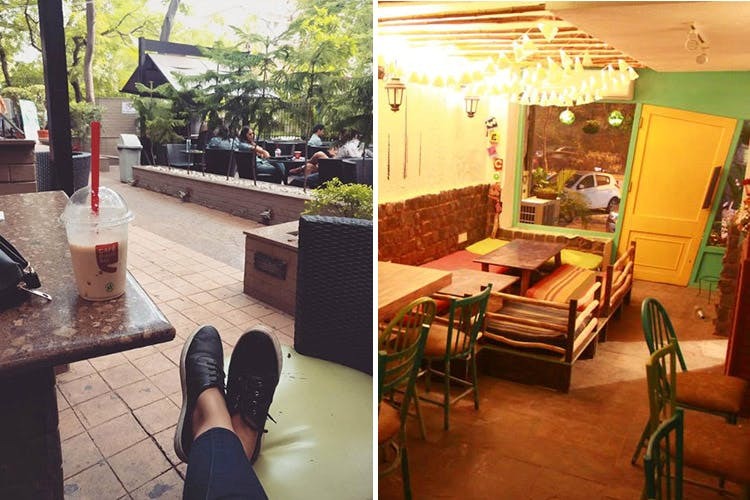 Our KNC and Gargi friends still make it a point to catch up with their college friends at Diggin every few months, because, just like for most DU kids, this cafe’s associated with a lot of good times.